Erin Larner strikes a backhand. She and the other seniors are looking to lead the Wildcats to advance in the NCAA Tournament. No. 12 Northwestern (21-5, 11-0 Big Ten) turned in one of its best-ever regular seasons in 2018 but fell to Michigan in the Big Ten championship. Entering this weekend’s regional round of the NCAA Tournament, The Daily’s women’s tennis writers convened to recap the regular season and preview the tournament ahead. 1. After starting the season 3-3, how did NU develop into the dominant force we saw from March on? Calvin Alexander: NU’s shaky start to the season was mainly due to its difficult schedule. Two of those three losses came against teams that are currently highly ranked — No. 5 Texas and No. 14 UCLA. However, in non-conference play, the Cats showed glimpses of the form that would propel them to the success they had for the remainder of the season by winning the doubles point in all six of their out-of-league matches. Brett Haensel: Coach Claire Pollard likened the team’s schedule to the college football grind, with each weekend’s matches being just as important as the last’s. After the Oregon loss — which was somewhat out of character — NU’s season could have gone either way, but with wins over No. 22 Washington and No. 7 Vanderbilt in consecutive weekends, the Cats continued to internalize Pollard’s mindset. 2. What went right for the Cats in their regular-season win at Michigan that went wrong in the Big Ten championship rematch? Haensel: With both matches ending with a final score of 4-3 and ultimately decided in the third set of the final match, it’s not too difficult to see there wasn’t much separating these two teams. Third sets and tiebreakers are often won by the finest of margins. With a third set deciding each match, the regular season and conference tournament championships could have easily been flipped. Alexander: Both matches could have gone either way. But one major difference in the two was that the first was played indoors, unlike the second. The Big Ten Tournament final was played on Minnesota’s outdoor courts and some NU players said they noticed the windy conditions. But in the end, nothing changed too drastically and we saw two tightly contested matchups between two rivals. 3. Hosting the regional round of the NCAA Tournament this weekend, how likely are the Cats to advance out of their group? How deep can they go in the tournament overall? 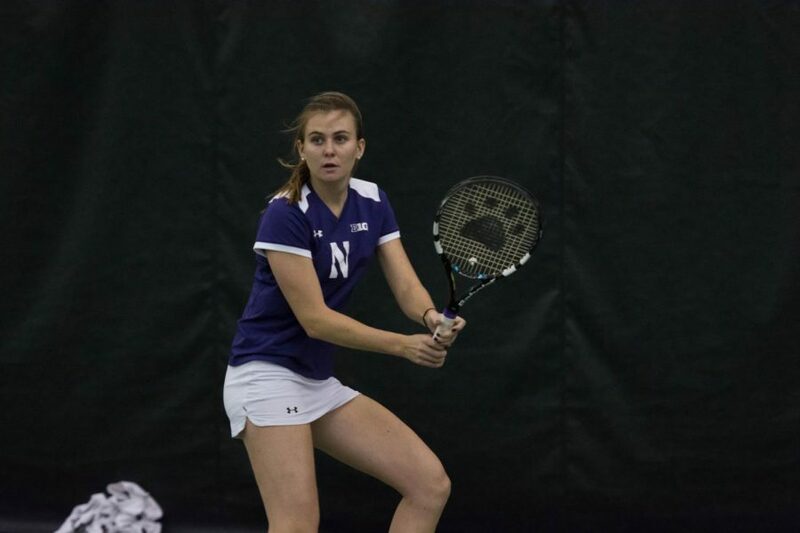 Haensel: With three wins over the nation’s top 10 and six against the top 25, NU has experience playing some of the best teams in women’s tennis. The Cats must first beat Buffalo, and they would be very unwise to overlook the Bulls before playing the winner of Kansas State, who lost ten matches over the course of the season, and Kentucky, who NU defeated earlier this year. Still, it would be surprising for the Cats to let their guard down early, especially with three talented seniors and a coach who won’t let her team come in unprepared. Alexander: This appearance marks coach Pollard’s 20th consecutive in the NCAA tournament; her expertise makes her bunch a dangerous foe for any team in the draw. The Bulls have only lost three matches this year, one of which was against Penn State in a 6-1 defeat. By comparison, NU beat Penn State by the same score. Since the Cats beat Kentucky earlier this season and have a much better record than Kansas State, NU has a very good chance at getting out of their section and has the potential to upset a top seed and advance past the sweet 16 down the road.